Archbishop of Canterbury: "We must go on looking outwards"
In his New Year Message to the nation, the Archbishop of Canterbury Justin Welby paid tribute at the National Memorial Arboretum to those who have “served, suffered or sacrificed for this country”, to whom “we owe a debt of unspeakable gratitude”. He spoke movingly of the ravages of war, the massacres of children, the persecution of Christians, the misery of disease, and the ever-present danger of forgetting those who are caught up in such hardship who might “slip from our minds”. We are a country formed in a Christian heritage, which calls us to sacrifice and self-giving; to open-handedness and hospitality.. When we are at our best, living out the generosity of Jesus Christ, as that has formed itself in our national character; when we turn outwards and use our best resources to change this world in which we live, we see what a wonderful heritage we have, and the hope we can bring to the poorest and those with the greatest suffering on the face of our planet..
And the Archbishop’s hope for 2015 is that we go on looking outwards, being full of a generous spirit, “because when we are generous we find joy, and others find comfort and hope”. It is a cause of great joy and a source of considerable blessing that we have in Justin Welby an Archbishop of Canterbury who reaches beyond the fusty metaphysics of theology and, like St Augustine before him, contemplates virtue in the perspective of true religion. He is no patronising ecclesiastic or aloof Christian moralist, but an agent of godly incarnation and a clear broadcaster of grace, love and kindness. You may point the doctrinal finger of accusation or harp on about something he didn’t do that, in your judgment, he jolly well ought to have. And you can focus on his weaknesses and vices or his failures and inadequacies, which are legion. But consider prayerfully his ministry and mission, and consider patiently his character, experience and resolve, and ask yourself – honestly – who amongst our current crop of spiritual and political leaders speaks so fervently and persuasively with such compassion of the need for justice and courage in the face of appalling adversity; and who might be better placed to assert a little corrective influence on the deliberations and decisions of those who seek to frame our national character in the narrative of secularism and the confines of self-creation. No amount of political ideology will re-associate morality with reality or rescue love from self-seeking. 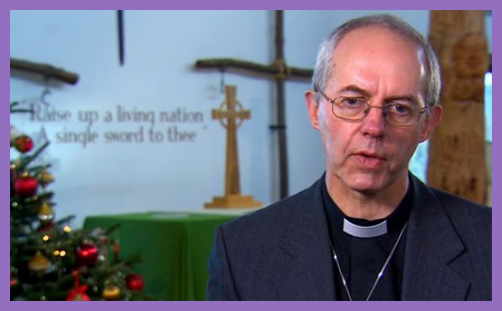 By exhorting the whole country to look outwards, and doing so with a plain reference to our Christian heritage and to the generosity of Jesus, Justin Welby confronts the manifest and expanding socio-political zeitgeist – the introversion of love into self-love, and the introspection of political policy toward the image reflected in the mirror of national identity. To love the United Kingdom is laudable, but the diminished jeopardy is idolatry. To love the Kingdom of God is to serve, suffer and sacrifice. In giving ourselves, the subject of our love, we become even more the object of His love, which is already His love in redeeming.